Fire does not always need to evoke images of pain, loss and suffering. Fire can also be a source of inspiration and joy. We, at Beyond Carlton, wish to celebrate such tales of grit, determination and positivity of fire accident survivors. Are you or anyone you know a fire survivor? What did you learn and what are things you do now after being through a fire situation? These could be valuable lessons for all of us. If not personally, have you known or read of a survivor who has lived through a terrible fire tragedy and has triumphed? Then we are all ears! We would like to know what they went through and importantly what would be their advice on how we need to prepare in case of a fire accident. Help us connect with such survivors and we promise to share their inspirational tales and advice with the world. 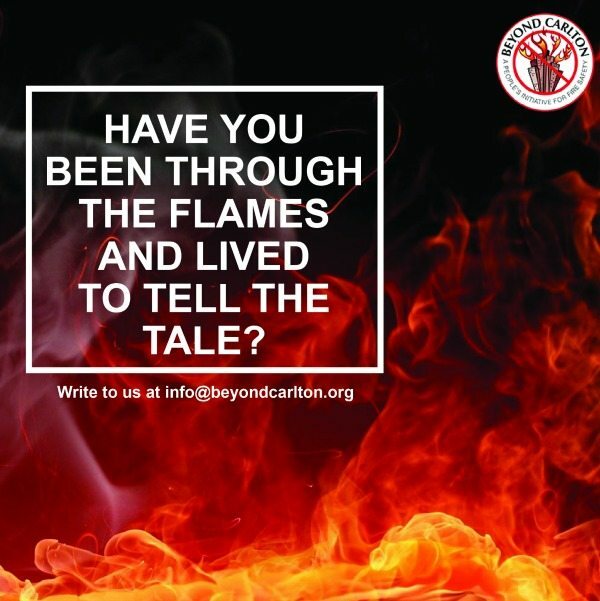 Do write to us at info@beyondcarlton.org and we can feature you on our website and our social media platforms. Do also spread this message among your family and friends. Let us learn and share the lessons of surviving a fire from folks like you and me. Also follow us on our Facebook and Twitter pages for more such exciting campaigns.